Eddie Valerio joined the crew of the USS West Virginia in September of 1945. He stayed aboard until June 1946. The week that hostilities ended as I boarded the ship I thought I was coming back to the States as a passenger. But after lounging about the decks for two days, my name was passed over the loud speaker to report to the personnel office. When I got there I was asked by the personnel officer, "Where have you been keeping yourself?" I said I have been mingling with the rest of the passengers! I was politely told that I was not a passenger, that I still had 13 months to do on my enlistment, and that I was on board for duty. Anyway we arrived in the States and we landed in San Diego, California. And as we docked in San Diego I was granted 30 days leave. And I left for Denver Colorado when my leave was up the Wee Vee had been making Magic Carpet runs to Pearl Harbor, picking up passengers that were being released from the Armed Forces. We made two runs to Pearl Harbor and after the second trip we went to Seattle, Washington. We landed in Seattle, Washington in January 1946 and there we were preparing to decommission the West Virginia. The Wee Vee was decommissioned in Bremerton, Washington, and put in Moth Balls. And that was my brief duty upon the Wee Vee. 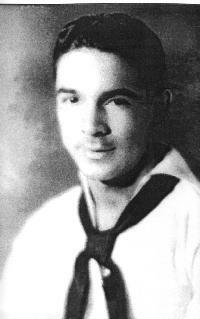 See Eddie's page on the USS Salt Lake City web site here.